2 3/4x 3 1/4x 4 1/4" tall stately, rare Arkansas blue phantom cluster has a small patch of granite along with milk quartz matrix. 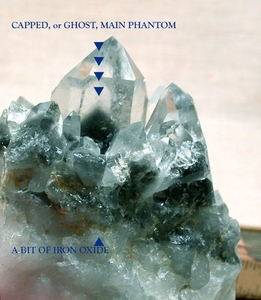 Individuals range from a twinned trans-channelling crystal with a layered 'ghost' phantom, to an acute Isis faced crystal with an uncommon 7h face, to a rainbow foil phantom crystal with a 1/2" penetrator. Titanium gas inclusions, devic and heavier veils, record keepers, and slight bright iron oxide contribute to the allure of this powerful cluster.